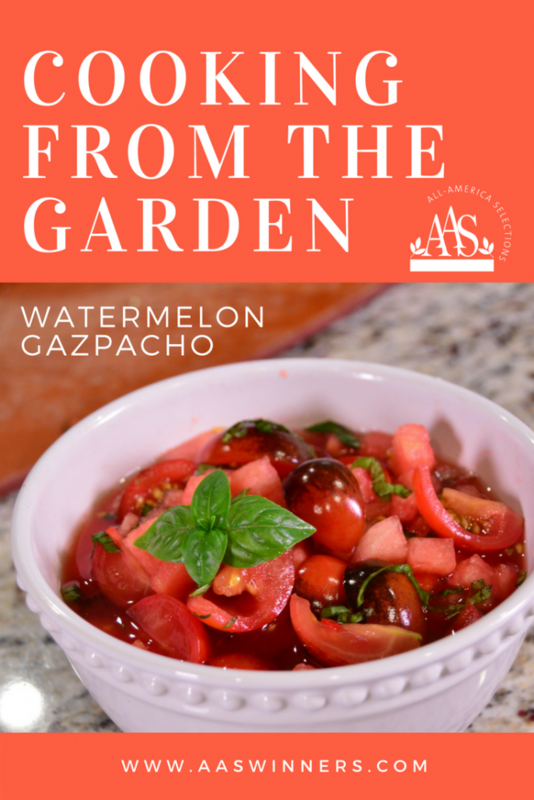 Watermelon gazpacho usually disappoints with savory flavors overpowering the sweet watermelon, or the sugary fruit drowning out the other flavors. This recipe gets it just right. Leave out the watermelon juice, add some cumin and serve this as a salsa over fried fish tacos. Watermelon Mini Love - 2017 AAS Vegetable Award Winner This personal-sized Asian watermelon is perfect for smaller families and smaller gardens. Each watermelon has a high sugar content resulting in sweet and crisp, juicy flesh. 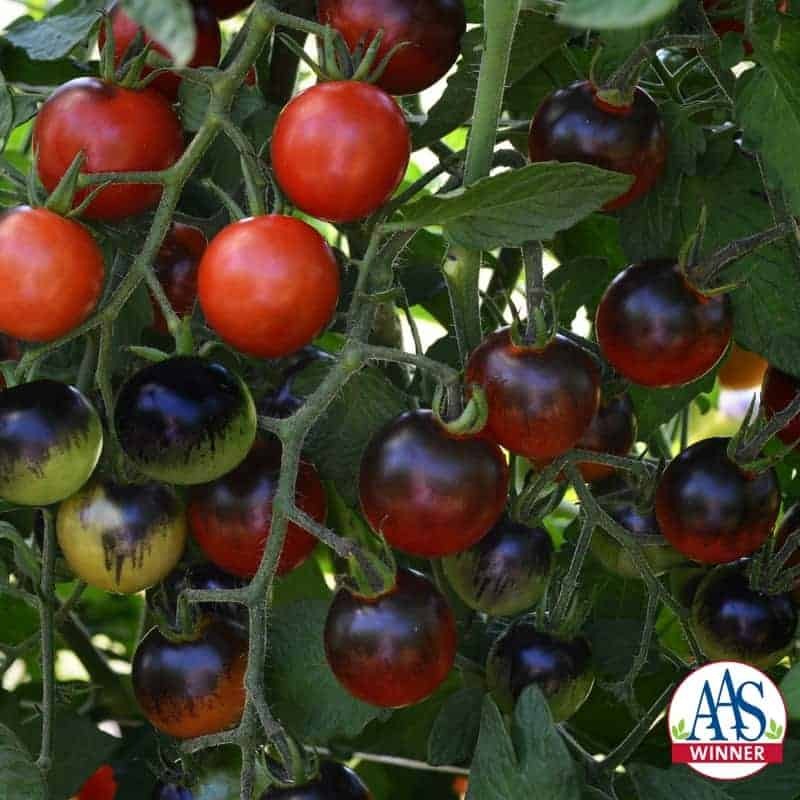 Tomato Midnight Snack - 2017 AAS Edible-Vegetable Winner - a unique indigo-type cherry tomato that ripens to red with a beautiful glossy black-purple overlay when exposed to sunlight. It is great in salads or eaten straight off the plant. 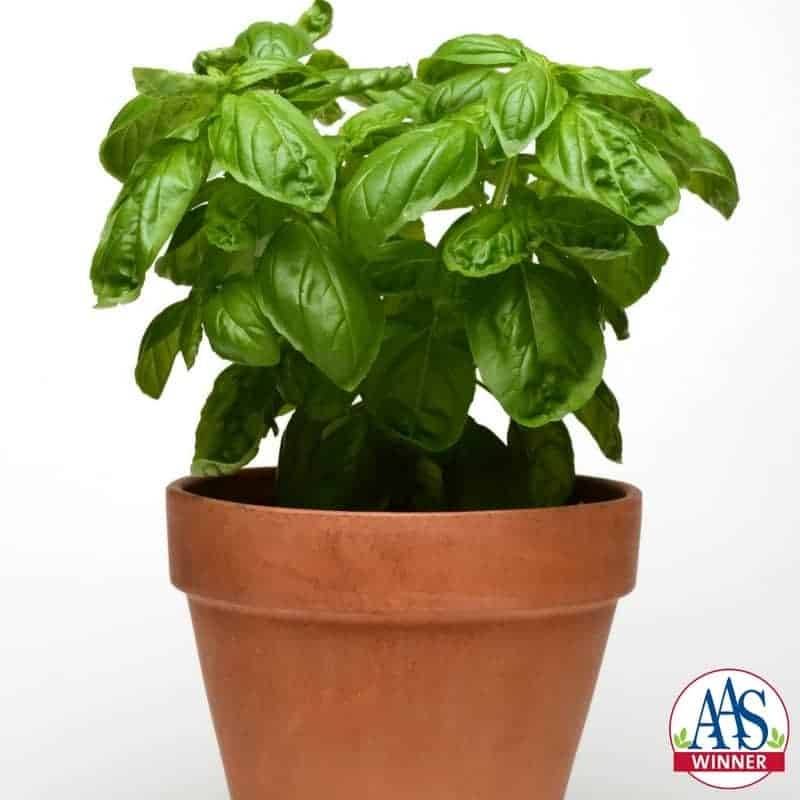 Dolce Fresca Basil - 2015 Edible/Vegetable AAS Winner - Great for gardeners looking for drought tolerant, hearty plants, foodies interested in a new and better basil and anyone who wants that great Mediterranean taste added to their cuisine. 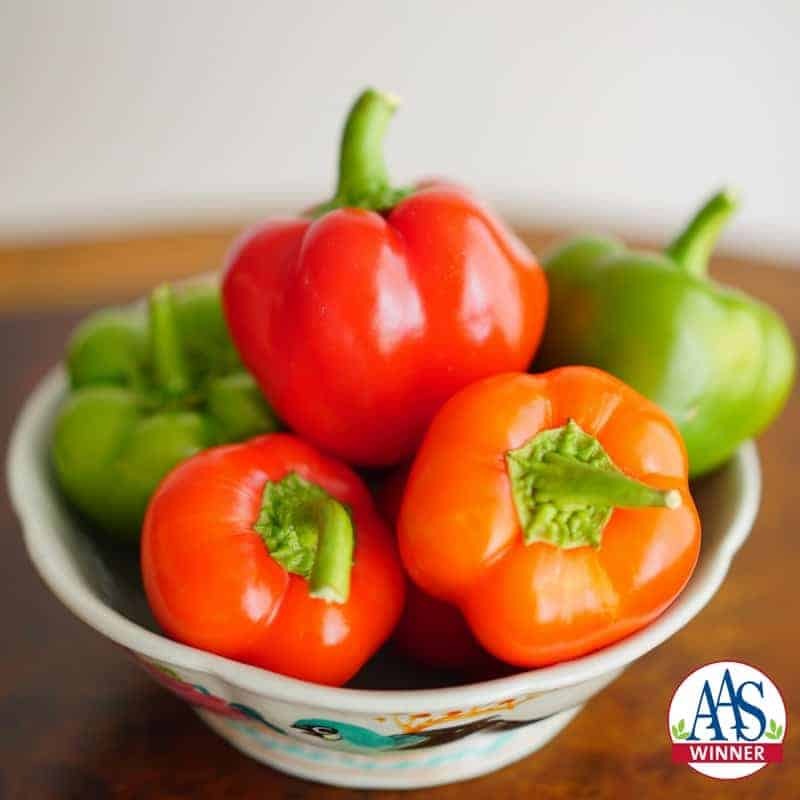 Pepper Chili Pie - 2017 AAS Edible-Vegetable Winner - A unique miniature Bell Pepper that is mildly hot when fruits turn red and are compact, easy to grow and adapt well to a container or small garden planting. Mix together 4 cups Mini Love watermelon, Midnight Snack tomatoes, and onion. Add lime zest and juice, Chili Pie pepper and Dolce Fresca basil. Press remaining 2 cups of watermelon through a food mill or puree in a food processor and strain out solids. Season to taste with vinegar, salt, pepper and honey. 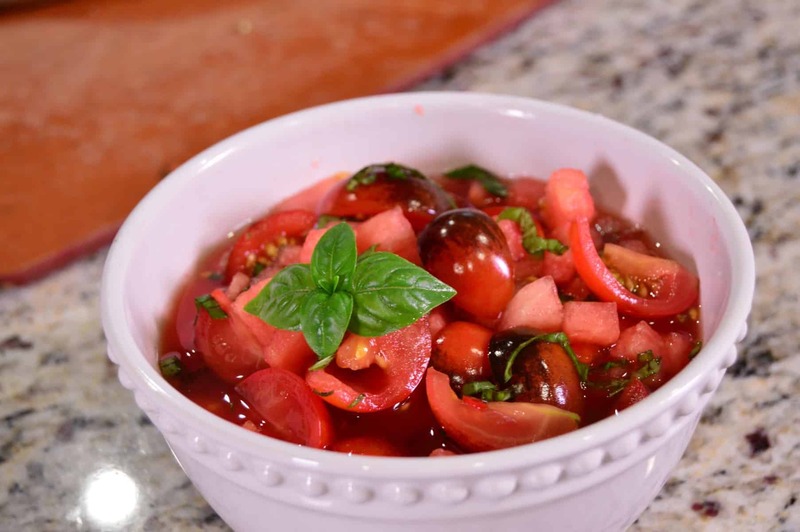 The salt brings out the flavors in the tomato and the honey make the watermelon pop. You’re looking for a good fruity, vegetal balance. In step 3, am I keeping the liquid of the solids? Strain out the solids sounds like we’re only to keep the liquids? Hi Betty! In step 3 you are juicing the remaining watermelon and discarding the few remaining solids. I like my gazpacho to have enough liquid to be a soup and not just feel like watery salsa. To punch up the watermelon flavor in this soup I juice some watermelon and use that for the extra liquid. Since watermelons are 92% water there will not be very many solids left behind. If you do not have a food mill, you can puree the watermelon in a blender or food processor and strain the juice through a fine mesh sieve.